What do you do when you are stuck at a boy's house because you're taking care of a sick boy but you can't be really near him lest you get sick yourself but if you suggest going home he whines like a puppy dog? You get lots of knitting done. Sorry for the hideous pics, but all I have on me currently is a camera phone. 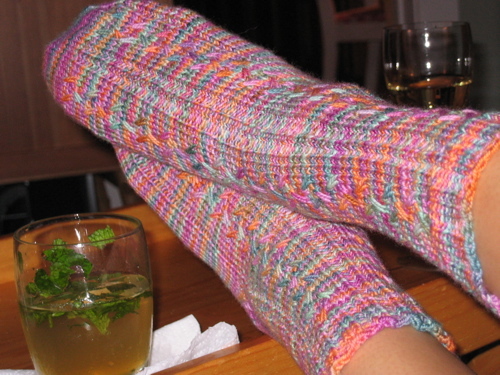 I'm halfway X 2 done with Spring is Coming socks. Well the ones on the needles are more than halfway done. I must say I am loving this method of abandoning a sock halfway through. I couldn't even imagine my psychological state thinking that I had a whole 'nother sock left. I've figured out what my mental block is. I detest gusseting. 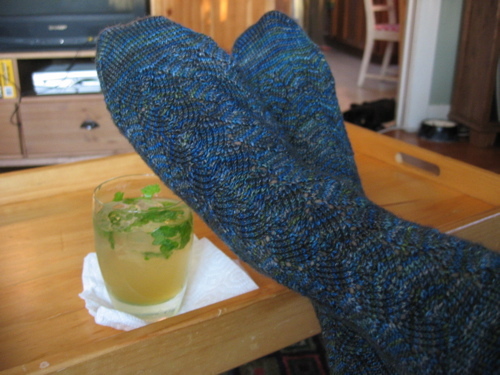 (Yes, gusseting is now a verbage word) Anyway, it's a lovely feeling to know that I'm at the home stretch for both socks. 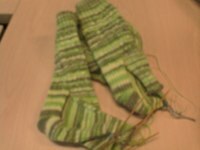 I also started on Don's scarf. And that's pretty much the last time you'll see a picture of it since it looks exactly the same for 6 more freaking feet. I think I got cabling without a cable needle down pat (quite nifty and I feel very clever). The 8 row pattern is involved enough that I'm not quite to the point where I want to stab myself in the eye (I'll check back with you at 4'). 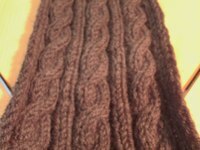 The yarn is also very nice on the Addis.